This sculpture in French limestone (Lepine stone) was first placed in the town centre in 1983, and known by some (irreverently) as The Three Bares. It was removed in 1984 because of vandalism. 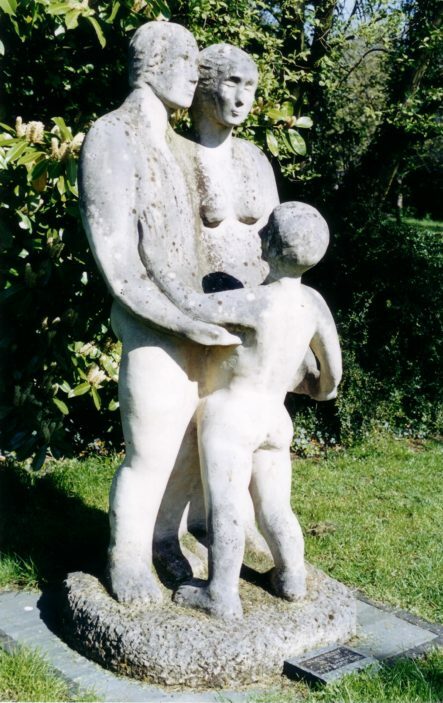 It was repaired by Harpenden sculptor Maureen Gardner in 1991, and according to the Herts Advertiser of 9th October 1991, it was “removed to the peaceful surroundings of Stevenage Lodge”, but has since been placed in the garden of Springfield House in Stevenage High Street. Glynis Beecroft, now Glynis Owen, trained at Goldsmith’s College, and subsequently became assistant to the sculptor Lynn Chadwick. She is a Fellow of the Royal Society of British Sculptors and a member of the Printmakers Council. She fulfills public and private commissions in stone, glass and metals from her studio in Hampstead. This page was added on 09/02/2011. I work at the Haven homeless hostel in Ditchmore Lane, but the hostel started at The Lodge, Frobisher Drive, Stevenage. The “Family” statue was not there then, but I am now on the committee at Springfield House where the statue now stands so I see it regularly. Its very grubby so we are looking at cleaning it up. Apart from being grubby its in excellent condition. I remember the ‘Three Bares’ when it was in the square outside Littlewoods (junction of Queensway and Park Place). The shop directly behind the statue complained that they looked out on to bare bottoms all day.